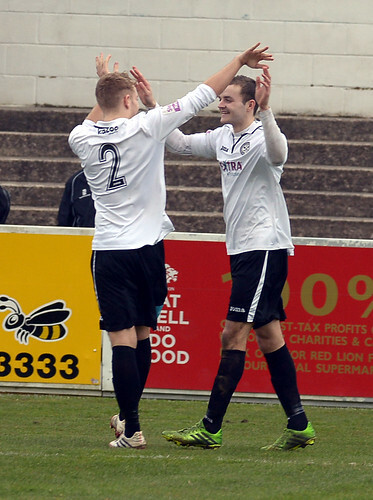 Hednesford Town got back to winning ways in the league thanks to an excellent 3-1 victory over Colwyn Bay, which moved them back into third place in the Skrill North. This was despite playing with ten men for nearly half an hour following Alex Melbourne’s sending off, writes Scott Smith. 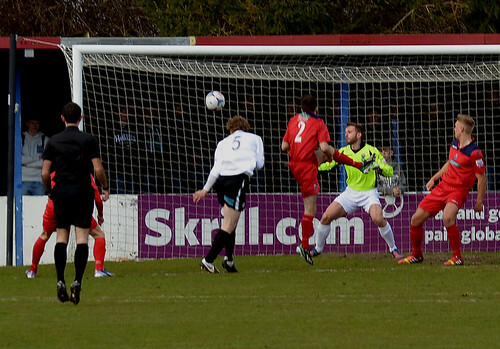 The Pitmen started well and took the lead in just the sixth minute. Jamey Osborne’s long throw into the box was nodded back to the creative midfielder and his cross was headed home by defender Paul McCone at the back post. The visitors continued to push and almost found a second just a minute later, only for Charlie Anagho-Ntamark to see his powerful header hit the crossbar following a fingertip save by Bay goalkeeper Chris Sanna. Meanwhile at the other end Hednesford shot stopper Dan Crane had little to do until the 28th minute mark when he smartly turned away Sean Williams’ free kick for a corner. Hednesford were continuing to cause problems for the Colwyn back line though with Robbie Thompson-Brown lobbing the ball over the bar after Nathan Blissett had forced a poor clearance from Sanna. It came as no real surprise when Town did add a second then in the 35th minute. Following a good one-two with Anagho-Ntamark, midfielder Melbourne found room in the box and his cross shot was turned emphatically into his own net by Bay striker Rob Hopley (og). 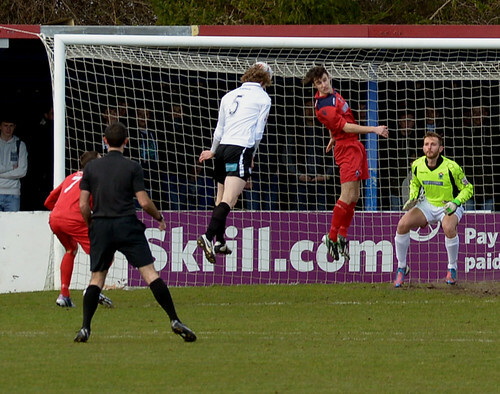 Right on the stroke of half-time the home side almost managed to find a way back into the game when the Town backline failed to clear their lines and Marc Williams saw his shot claimed on the line by Crane. 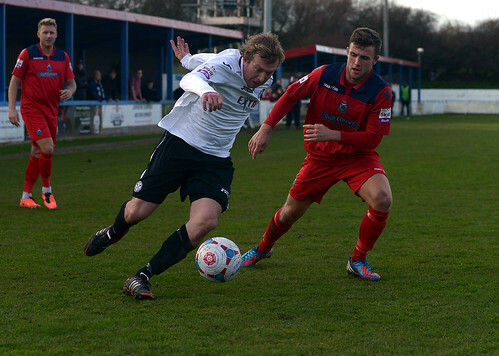 Hednesford started the second half in blistering form though and they made it 3-0 just a minute after the restart. Anagho-Ntamark managed to release Melbourne down the right-hand-side and his first time cross picked out Osborne who headed home past the stranded Sanna. The home side didn’t give up though and they saw a glimmer of hope when they reduced the arrears in the 54th minute when substitute Cameron Darkwah stabbed home past Crane from inside the penalty area. Their prospects increased further when the hard-working Melbourne was shown a straight red card for a late challenge on Marc Williams. After consulting with his assistant, the referee decided that a dismissal was his only option. Despite this, Bay failed to really assert any authority on the match and although Sean Williams saw an effort flash just wide of the upright, Hednesford were able to deal with everything which came into their penalty area. In the end though the first 45 minute spell proved to be the difference between the two sides on the day as Town took their chances to record their first ever league victory at Bay. The Pitmen now have a break from action until this coming Saturday, 22nd March, when bottom side Workington are the visitors to Keys Park.